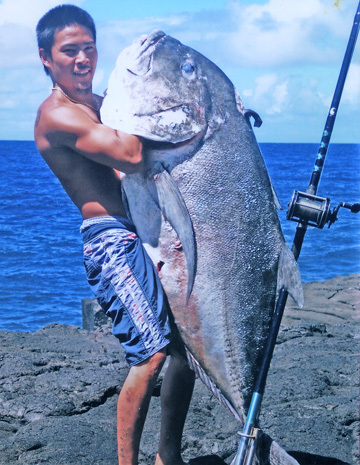 Dustin Tomono was fishing on the Puna Coast of the Big Island of Hawaii using a 13-foot Talon pole, Newell 646 reel and 80-lb test Maxima line when he hooked his huge, 131.2-lb giant trevally. He weighed his big boy at J. Hara Store. This was the first ulua Dustin ever caught!